This comprehensive plan for the three unions clarified the mission to align with Student Life's priorities and aspirations. Michigan Union - "Student Involvement and Community Center"
The Michigan Union strengthens opportunities for student involvement and building community within a beloved structure, while restoring its role as a central gathering space for the entire University population. Surgical interventions clarify zoning of overall programmatic functions and preserve the historic legacy of the main level. A vital social pathway connects a new coffee lounge on the main level, a billiards space on the second level, and consolidated student organization spaces on the third level. Michigan League - "Gracious Hospitality"
The historic Michigan League must balance its conferencing and hotel functions with a desire to extend its relevance to current and future students. Internal rezoning distinguishes various hospitality and campus functions, while making student-focused spaces more prominent. Comfortable student lounges and revitalized food venues enliven the main level. Moving the large production kitchen to the lower level provides a more gracious setting for social interaction. Pierpont Commons - "Expressive Innovation"
Pierpont Commons must reflect North Campus' creative culture from students in the arts, engineering, and architecture. 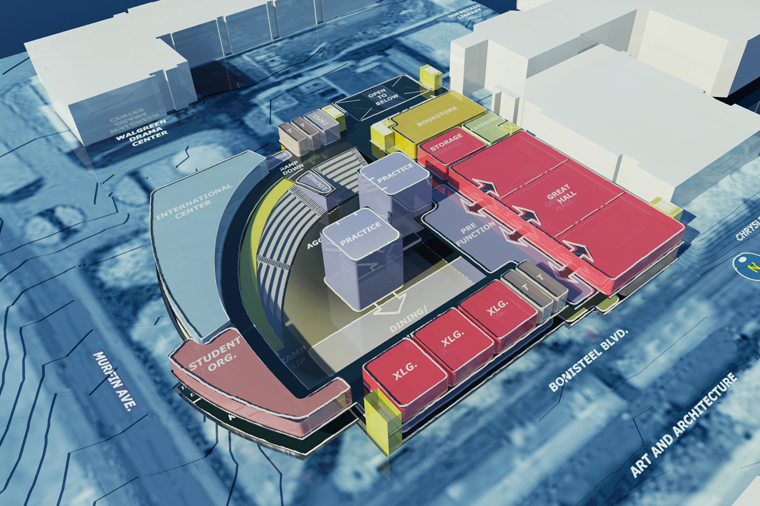 A new five-story building of approximately 235,000 GSF includes a transportation hub, vibrant dining experiences, ample lounge spaces, retail, student services, and additional meeting and event spaces. The physical and conceptual core is a large, multi-use "Agora," a civic space defined by two practice/performance spaces, a stage, and adjacent stepped seating along a major student circulation path. Tech-enabled collaborative spaces create additional opportunities for creative exchange.